Fans of Crazy Ex-Girlfriend knew that star and co-creator Rachel Bloom’s hyperactive, imaginative heroine, Rebecca Bunch, was not the type to take things lightly after being jilted in the Season Two finale. But what does that mean for the opening number? Last season’s peppy, optimistic Broadway-style theme, “I’m Just a Girl In Love,” doesn’t exactly jibe with a woman newly scorned. Nor does the first year’s partially animated ditty about a successful and delusional New York lawyer who decides to relocate to (and this is so weird, right?) her first love’s hometown. But audiences probably aren’t eager to tune in each week for a musical comedy version of Fatal Attraction. This is a conundrum the staff doesn’t take lightly. Although Bloom was convinced she’d figured out the Season Three theme song before the writers’ room gathered earlier this year, mapping out plots and character arcs made her change her mind. 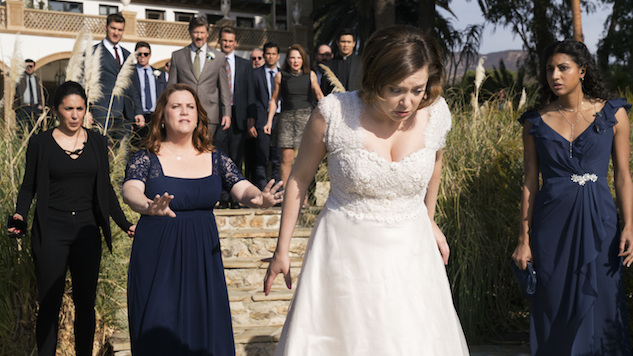 Crazy Ex-Girlfriend co-creator Aline Brosh McKenna says that, as of our interview—shortly before production on Season Three began in July—at least 10 drafts of that number had been written. Most were left to wither away in email chains or on hard drives. One got resurrected and will appear in the season’s fourth episode. Even the final version was still being tweaked. Songwriter, staff writer and supervising producer Jack Dolgen points out that “theme songs are hard even when they don’t have to be funny,” because their whole point is to keep the audience engaged. And if those sequences happen to be earworms? Nothing wrong with that. Despite the headaches that came with trying to land Season Three’s opening number, Bloom is still planning ahead. She says she’s “90-percent certain” of what the theme song for the fourth—and, she says, most likely final—season will be, and that it will continue with this year’s themes. And if not, she’s got plenty of rejects from this year to help her decide. Season Three of Crazy Ex-Girlfriend premieres tonight at 8 p.m. on The CW.